Part of the Society of Dairy Technology Series, this book deals with a commercially significant sector of dairy science. The book includes chapters on legislation, functionality of ingredients, processing plants and equipment, manufacturing best practice, packaging, and quality control. The chapters are authored by an international team of experts. 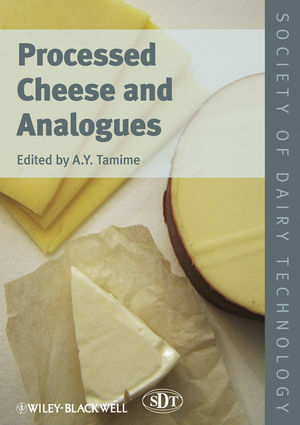 This book is an essential resource for manufacturers and users of processed and analogue cheese products internationally; dairy scientists in industry and research; and advanced food science students with an interest in dairy science. A.Y. Tamime is Consultant in Dairy Science and Technology, Ayr, UK. He is the Series Editor of the SDT’s Technical Book Series. 1 Processed Cheese and Analogues: An Overview (A.Y. Tamime). 1.4 Principles of manufacturing stages. 1.4.2 Formulation of a balanced mix. 1.4.4 Addition of miscellaneous additives. 1.4.7 Filling machines and packaging materials. 2 Current Legislation on Processed Cheese and Related Products (M. Hickey). 2.2 Definitions and standards of identity. 2.2.2 Legislation in the European Union (EU). 2.2.3 Legislation in the UK. 2.2.4 Legislation in the Republic of Ireland. 2.2.6 Legislation in the Netherlands. 2.2.12 Legislation in the Czech Republic. 2.2.14 Legislation in the USA. 2.2.16 Legislation in Australia and New Zealand. 2.2.17 Legislation in Japan . 2.2.20 Legislation in some Middle Eastern countries. 3 Effects of Natural Cheese Characteristics and Processing Conditions on Rheology and Texture: The Functionality of Cheese Components in the Manufacture of Processed Cheese (T.P. Guinee). 3.1 Definition of processed cheese products: an introduction. 3.4 Principles of processed cheese manufacture. 3.4.1 Destabilisation and dehydration of milk during the manufacture of natural cheese. 3.4.2 Characteristics of protein in natural cheeses. 3.4.3 Effects of heating/shearing cheese (protein). 3.4.4 The interaction of emulsifying salt with cheese protein during processing. 3.5 Effects of natural cheese characteristics on PCPs. 3.5.3 Degree of maturity and intact casein content. 3.6 Effects of processing conditions. 4 Functionality of Ingredients: Emulsifying Salts(J.A. Lucey, A. Maurer-Rothmann and S. Kaliappan). 4.2 Main types of emulsifying salts. 4.2.3 Other types of emulsifying salts. 4.3 Properties and roles of emulsifying salts used in processed cheese. 4.3.2 pH adjustment, buffering and titration behaviour. 4.3.3 Casein dispersion, protein hydration and fat emulsification. 4.3.4 Creaming and structure formation during cooling and storage. 4.3.6 Crystal formation and other properties of emulsifying salts. 4.4 Selection of emulsifying salt. 5 Flavours and Flavourants, Colours and Pigment(G. Osthoff, E. Slabber, W. Kneifel and K. D¨urrschmid). 5.2 Types of processed cheese. 5.5.2 Colour decay and changes. 5.6 Sensory attributes of processed cheese. 6 Manufacturing Practices of Processed Cheese (M. Nogueira de Oliveira, Z. Ustunol and A.Y. Tamime). 6.3 Processed cheese and products. 6.4 Key steps in processing. 6.4.4 Formulation of the cheese blend. 6.4.9 Rate of cooling and storage. 6.5 Changes in processed cheese during its shelf-life. 7 Processed Cheese Plants and Equipment: A Practical Overview (S. Dixon). 7.2.1 Weighing the ingredients to be processed. 7.2.4 Blending the ingredients to form a standardised cheese mix or blend. 7.2.5 Transferring the standardised cheese blend to a cooking system. 7.2.6 Direct steam injection into the cooking systems. 7.2.7 Filtering the molten cheese. 7.3 Processing plant for the manufacture of processed cheese slices. 8 Packaging Materials and Equipment (E.M. Buys and J.F. Mostert). 8.2.2 Functions of a package. 8.2.3 Types of packaging materials. 8.2.4 Hygiene of packaging material. 8.2.5 Shelf-life and interactions with packaging materials. 8.3.6 Tubs, jars, cups and plastic containers. 8.3.8 Packs with external decoration. 9 Production of Analogue Cheeses (E.D. O’Riordan, E. Duggan, M. O’Sullivan and N. Noronha). 9.3 Applications and advantages of analogue cheese products. 9.4 Manufacture of analogue cheese. 9.4.1 General principles and manufacturing protocol. 9.4.2 Key ingredients used in the production of analogue cheese products. 9.5 Factors influencing analogue cheese functionality. 9.5.1 Hydration of protein: impact on cheese functionality. 9.5.2 Effect of compositional change on analogue cheese functionality. 9.6 Developments in analogue cheese. 9.6.3 Microwave expansion of analogue cheese. 9.7 Future of analogue cheese. 10 Quality Control in Processed Cheese Manufacture (A.Y. Tamime, D.D. Muir, M. Wszolek, J. Domagala, L. Metzger, W. Kneifel, K. D¨urrschmid, K.J. Domig, A. Hill, A. Smith, T.P. Guinee and M.A.E. Auty). 10.2.5 Monitoring the processing plant. 10.3 Examination of raw materials. 10.3.2 Butter and fat of plant origin. 10.3.8 Sampling for quality appraisal of the retail product. 10.4 Analysis of chemical composition. 10.5 Microbiological quality and safety of the product. 10.5.1 Introduction and microbiological techniques. 10.5.2 Microbiological safety of the product. 10.5.3 Preliminary treatment of natural cheese milk and effect. 10.6 Assessment of physical characteristics. 10.7 Assessment of the microstructure. 10.7.2 Some aspects affecting microstructure formation. 10.7.3 Cryo-SEM description of processed cheese microstructure. 10.7.4 Faults in processed cheese products. 10.7.6 Application of confocal scanning laser microscopy . as a quality control tool in processed cheese manufacture. 10.8 Sensory profiling of processed cheese. 10.8.1 Elements of sensory assessment. 10.8.6 Analysis and interpretation of data. Appendix: Example of a product quality information as a result of using a HACCP system.